Who let the dogs out? 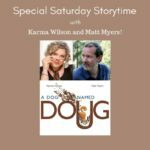 In this episode we interview the amazing Karma Wilson and Matt Myers, creators of the new picture book, A Dog Named Doug. 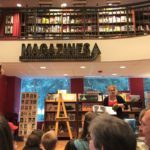 These two couldn’t have been nicer, and their book is perfect for storytime. Then it’s time for our favorite songs and rhymes about furry, feathered, and scaly friends. 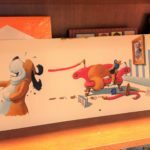 “A Dog Named Doug” was one of our featured Book Buzz titles in Ep. 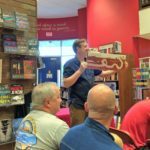 4, so imagine our excitement when we saw that Karma Wilson and Matt Myers would be visiting our local independent bookstore! Karma was so nice to agree to an interview after we reached out on Twitter. And Matt was such a good sport because he didn’t know we wanted an interview with him until we got there! The day of the event we headed over to Quail Ridge Books and enjoyed a reading of the book. Karma donned some furry ears and paws! 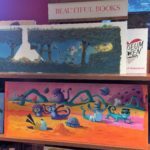 Matt was able to bring some of his original paintings for the book. They are just amazing and so creative! We learned so much from these two about their backgrounds and the process of creating a picture book. 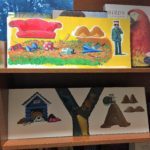 Featuring rhyme and repetition, as well as humorous illustrations, we can’t wait to read “A Dog Named Doug,” in storytime. For more info and our interview with Karma and Matt, take a listen to Ep. 9. 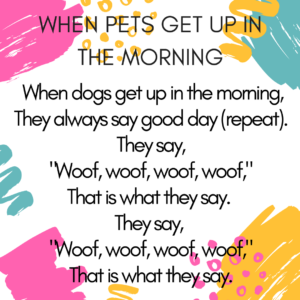 This is “When Ducks Get Up in the Morning,” just changed to be all about pets! 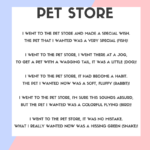 Add additional verses for cats, birds, fish, etc. 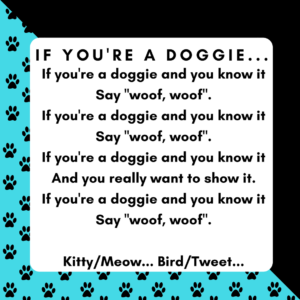 This is a fun song that has lots of actions to get the kids involved. Check out Ep. 9 for more details, and the King County Library System’s videos to see the movements. You’re sure to have lots of participation with this song that’s to a familiar tune (“If You’re Happy and You Know It.”). Have the kids practice making the animal sounds beforehand and add in some movements, too. Lauren completely forgot to talk about one of her favorites that she’s currently using every week in preschool storytime this session. 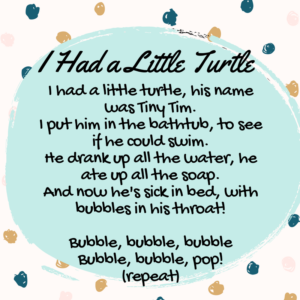 This song has lots of motions, and you can have the kids make the ASL sign for turtle. Don’t forgot to make a loud CLAP! for the popping bubbles! Watch Jbrary demonstrate here. For a soothing storytime song, try Sheldon Cooper’s “Soft Kitty.” Have the kids curl into a ball and purr! 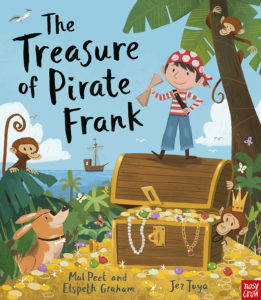 The Treasure of Pirate Frank is a cumulative tale that’s a great pick for preschool storytime. A boy and his dog set sail in search of treasure, braving stormy seas, mountains snowy and cold, the forest where the monkeys swing, the swamp where the bullfrogs sing . . . and other challenging obstacles, before finally reaching the end of their quest. But wait! Pirate Frank is Sally Frank! And she doesn’t want to share. Back home they go, retracing their steps before sailing away to dream of the treasure they’ve lost. 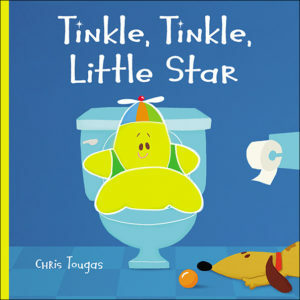 This board book by Chris Tougas features an adorable star who needs to tinkle. Simple rhymes offer gentle reminders to Little Star about where not to tinkle: not in the car, not on a train, not a plane. Not in a sandbox, not on a slide — and certainly not on Grandpa’s knee! And then, of course, there’s the golden rule: never tinkle in the pool! 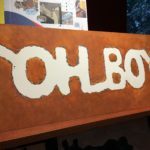 This book will get everyone laughing in storytime, plus it’s a fun gender-neutral recommendation for those looking for books about potty-training. "Episode 10: A Day at the Beach"